Dance has always been a part of many sacred ceremonies and traditional rituals in the island. Some dances are considered sacred as they are offered to the Gods or the deities, while others are simply performed for the audience. Pendet dance is a simple welcoming dance choreographed to welcome the audience. The dance is one of many dances that are often performed not only during a sacred ceremony at the temple, but also at a commercial stage to entertain the audience. Pendet, choreographed by I Wayan Rindi, presents a graceful way of welcoming people. The dance begins with a group of dancers, female dancers, slowly entering the stage, each of them holding a bowl of flowers, just like the Hindu Balinese style of offering. They then make a vajrasana pose- sitting on their heels with their calves beneath their thighs, their hands moving as if they ar­e praying. This pose is related to a Hindu belief, which is to always start any activity with a prayer. 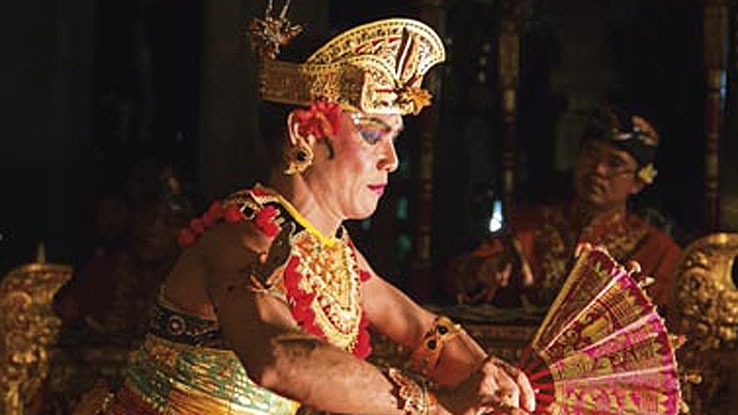 Several Balinese dances have been modified, with the basic routines being performed in a dynamic way. The gamelan, Bali’s traditional orchestra, leads the dancers with their vibrant musical arrangement. The bright colours and elaborate costumes help entertain the eyes during the routines. Hairpieces made of golden flowers adorn the dancers’ neatly arranged hair. Sometimes fresh flowers are also added to enhance the ensemble. Brightly coloured eyeshadows and red lipstick make their faces stunning under the lights. Several colours of Kain Prada- Bali’s authentic gold print fabric, is wrapped tightly from chest to hip covering the top of their slender body creating gorgeous layers of colour. From hip to ankle, another layer of flowy fabric is attached. The smiles never disappear from the dancers’ faces during the performance. Their bodies move in elegance from one routine to another. 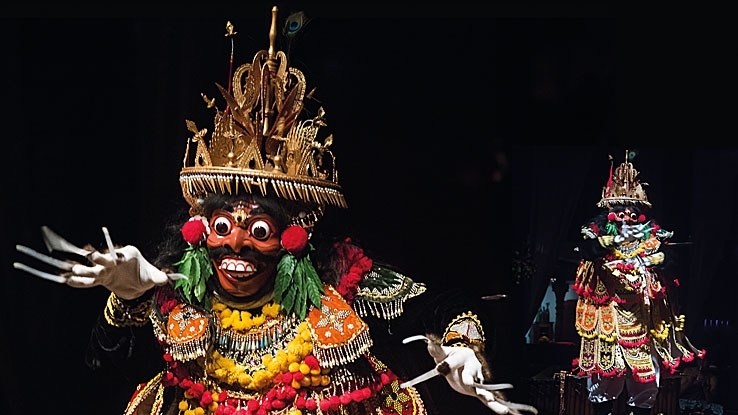 Their eyes also play an important role in this dance just like the other dances of Bali. The eye movements are sharp and show strong emotion. It is amazing to see how their eyeballs quickly shift from the upper left corner to the lower right corner and vice versa. A long period of practising has definitely perfected their performance. Towards the end of the Pendet Dance, one significant routine is performed. It is when the dancers pick a handful of petals from the bowl and toss it in the air as if showering the audience with the petals. 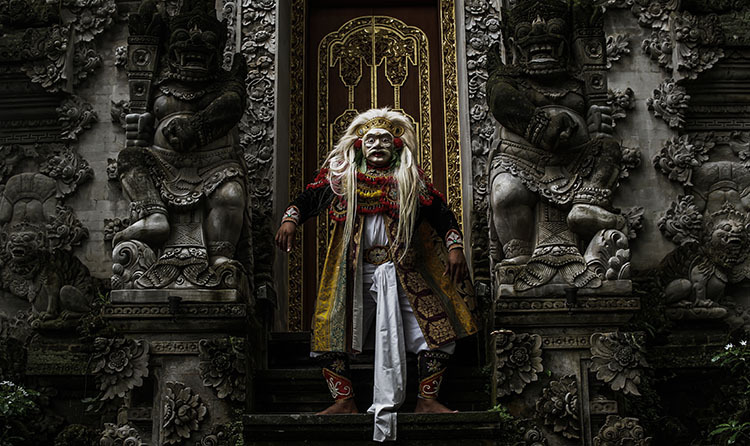 Watching these performances during your stay in Bali will give you a taste of the artistic side of the Balinese and let you witness the traditional art performances that have been preserved for many generations. One may notice that the young generation in Bali are now preoccupied with modern technology and social media, but they are still interested in learning how to perform the traditional dances of their homeland and even to create some new choreography.